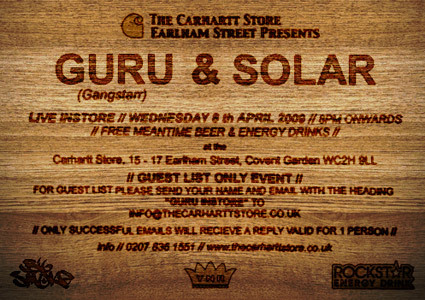 London: Guru &amp; Solar perform at Carhartt Shop! This is a completely free event however, due to the volume of people turning up to the event, this will a guest list only night. To reserve and guarantee your place on the guest list, you need to email us with your name and email with the heading “GURU INSTORE” to info@thecarharttstore.co.uk. Successful applications will receive a reply email. Each successful email will be valid for only 1 person. No plus 1’s, mates rates or “but what about my bird? !” Sorry. Other DJ’s and acts TBC. Promises to be a big, big night. If you cant get into Cargo, then come and see the big man for FREE! Keep an eye on the Carhartt UK Blog for more Info on this very exclusive gig!